Alta Devices will be exhibiting at the 32nd Annual Small Satellite Conference in Logan, UT this year at Booth 145. On display will be Alta Devices solar technologies and TSL and NSL SmallSats. NanoRacks will be in attendance at the Small Satellite Conference in the East Colony Room. Twiggs Space Lab, LLC is focused on creating STEAM based products and curriculum to stimulate, engage, and encourage students to pursue interests in science, technology, engineering, arts, and math. The company’s mission is to inspire future generations of engineers and scientists to make the world a better place through innovative research in space. Prof. Twiggs was a consulting professor at Stanford University Department of Aeronautics and Astronautics starting in 1994 where he established the Space Systems Development Laboratory. While at Stanford in 1999, he was the co-developer of the CubeSat concept. 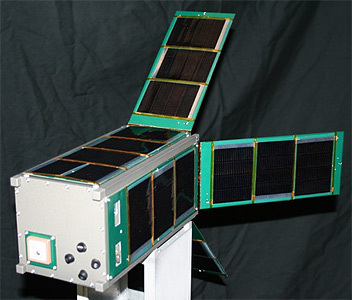 Prof. Twiggs was also the creative mind responsible for developing the original concepts for the CricketSat, CanSat, and the PocketQube for educational applications for use in space. Prof. Twiggs has published numerous papers and made dozens of presentations at technical conferences in the US and internationally. NanoRacks is the world’s first commercial space station company with an existing customer base. The company offers low-cost, high-quality solutions to the most pressing needs for satellite deployment, basic and educational research and both at home and in 30 nations worldwide for those new to the industry and aerospace veterans. Since 2009, Texas-based NanoRacks has truly created new markets and ushered in a new era of in space-services. As of July 2018, over 700 payloads have been launched to the International Space Station via NanoRacks services, and our customer base includes the European Space Agency (ESA) the German Space Agency (DLR,) the American space agency (NASA,) US Government Agencies, Spire, Millennium Space Systems, Space Florida, NCESSE, Virgin Galactic, pharmaceutical companies, and organizations in Vietnam, UK, Romania and Israel. Alta Devices is Empowering Autonomy™ by delivering the world’s most efficient, thin and flexible mobile power technology. By converting light of any kind into electricity, Alta Devices’ AnyLight™ power technology extends the energy source of a system, and in many cases, completely cuts the traditional power cord. The solution can be completely integrated into the final system, and is ideal for use in small satellites, unmanned systems, consumer electronics, sensors, automotive, remote exploration, or anywhere size, weight, and mobility matter. Alta Devices holds world records for energy conversion efficiency and is headquartered in Sunnyvale, CA. For more information, visit www.altadevices.com. Alta Devices is a Hanergy company.